Meet Toymail, an immersive, amusing and intuitive way to send voicemail to kids via five animal-shaped mailmen. If you have ever wished that you could play with your child while you’re shopping at the supermarket, or when you’re halfway around the world at a work conference, then this “toy messenger” as the co-founders refer to it, might just be the product you’ve been looking for. Aspiring to make toys more social and family oriented in an age when digital products are becoming a commonplace factor across households, the duo team of Audry Hill, a mother of three and registered nurse in Michigan, and Gauri Nanda, the innovator behind Clocky, “the alarm clock that runs away,” co-founded Toymail Co. Substantially aware of the products that were already out there, the two entrepreneurs knew that they didn’t want to place kids in front of another screen, isolating them from their surroundings and loved ones, and they certainly didn’t want to create a simplified version of a smartphone for kids. Instead, after extensive market research, they designed a prototype that not only connected a child to their parent or other family members, but also encouraged the child to continuously use their imagination. Empowered via built-in Wi-Fi and the Toymail iOS app (an Android app is already in the works), the toys allow for a two-way conversation, giving room for a highly interactive experience. Here’s how the product works: the adult can record a message in either their own voice or a digitized version and send it to the child via the app. Once the message is delivered to the child, the toy will start to make an array of noises, from wheezes to snorts, to alert them that there is something waiting for them in the inbox. With a play and record button designed in the back of the product, a child can easily reply back after receiving a message, which is then delivered to the adult’s phone. However, only those who have been approved via the app can communicate with the child; therefore, one doesn’t need to worry about strangers calling in. And in the case when you forget to send a personalized message or simply run out of things to say on a particular day, the Toymail app will automatically send a song, fun factoid or quote to the toy, so that your child can have uninterrupted play. Currently, the toys are priced at $50 each, with additional costs warranted by the app in the form of stamps. In order to record and send messages to the child, a family member must purchase a book of 50 stamps priced at $0.99, or obtain a monthly subscription priced at $2.99, which allows for unlimited messages to be sent. Acknowledging that technology can be a helpful and interactive learning experience for children when used the right way, both Hill and Nanda wish for parents and other family members to use the toys as a supplement (perhaps, when not in the same place as the child) and not as a substitute for regular playtime or communication. “When it is at its best, it makes the world more efficient, collaborative, and easier to live in. At its worst, it robs us of everyday human interaction and the benefit of face-to-face communication. It is many things all at once. What it is for sure is ever evolving,” Nanda and Hill said of technology today. Despite their Kickstarter campaign coming to a close in less than 37 hours and with Christmas right around the corner, Hill and Nanda took time to discuss the design of the product, the characters’ stories, and the importance of making toys more social. GALO: On your Web site it states that you “believe that technology for kids should be made with more soul” and that you “didn’t want to create a toy that puts a kid in front of the screen.” How did the idea for this technological creation transpire and why is it of importance to you to make kids’ technology and toys more social — what do you envision the toys of the future to be like? Audry Hill and Gauri Nanda: So many “connected toys” are just a lot of flashing lights and sounds. The apps that power them don’t make them more interesting. We wanted to embed technology into a toy so that it could become something new every day, and, in doing so, grow with the child. We also wanted to create a toy that could become something social. In making a toy where users create the content, we have simultaneously achieved both of those goals. As for the future of toys, what we are doing is part of an emerging trend. Toys are just beginning to be a part of the Internet of things. You are going to see a lot more connected toys, and our goal was to create one that didn’t isolate a kid behind a screen, but that allowed people to participate in their play remotely when they could not be there to do the job in person! 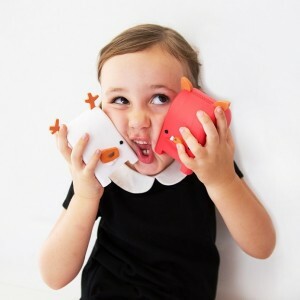 GALO: The toys are a mix between a cartoon-like animal and a mailbox. Why did you choose this type of design for the toys, instead of a plush animal or even a basic smart phone for kids, and why make them a portable size instead of life-size? AH & GN: We considered plush, and may do a “soft” version in the future. But, I suppose, we wanted a departure from the usual. We want everything we design to be new and fresh. As for the mailbox base, we were really taken by the theme of the post office in general. It is a space that is easy to romanticize. But also, Toymail is part of a new frontier of toys that work with apps. We didn’t want parents and grandparents to feel overwhelmed by that. We had a simple idea — to send mail to toys — and we wanted the form of a mailbox to call out that function. We never considered making the toy life-size because it is wirelessly enabled to work with a home Wi-Fi network, so we wanted it to be somewhat portable. The last thing we wanted was to make it look like a phone. We wanted it to be able to stand alone as a toy, even without the technology. Our beta testers were all the proof we needed that we had done that — before they knew what the toys “did” they began to stack them, make animal noises with them, balance them on their heads, and make the mailboxes dance and fight.